"A religion or religious sect generally considered to be extremist or false, with its followers often living in an unconventional manner under the guidance of an authoritarian, charismatic leader." -- from The Free Dictionary definition of the term "cult"
As Larry Sabato of the University of Virginia's Center for Politics told the Boston Globe, for an October 13, 2012 story, "Romney is counting on evangelicals. The irony is that this is a shotgun marriage between two very different religions but they are completely dependent upon one another for victory." But even before that Boston Globe story hit the press, an emerging public relations debacle of the first order was undermining consummation of the "shotgun marriage" and now, with only three weeks before the 2012 presidential election, millions of Americans are confronted by news stories with headlines that feature the terms "Mormon" and "cult". 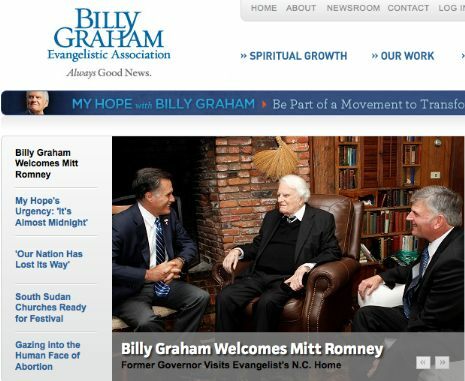 On October 11, 2012, aging evangelical icon Billy Graham met, prayed with, and in effect endorsed presidential candidate Mitt Romney. But Graham's endorsement backfired when an LGBT rights group discovered an article on the website of Graham's flagship organization, the Billy Graham Evangelistic Association, apparently authored by Billy Graham himself, that labeled Mormonism a "cult". In a textbook case of ineffective damage control, Graham's BGEA proceeded to wipe the offending article from the BGEA website but left in place other BGEA website articles that conveyed the same message. Visitors to the Billy Graham Evangelistic Association website who use the site's search engine to search for the term "Mormon" will get six search results; the first will be a page featuring Billy Graham's own definition of what a "cult" is, an explanation that clearly encompasses Mormonism. "[Cult] Members reject what Christians have believed for almost 2,000 years, and substitute instead their own beliefs for the clear teachings of the Bible. Often, they add to the Bible by claiming that the books their founder wrote or "discovered" are from God, and have equal authority to the Bible." Founder of Mormonism Joseph Smith discovered new books of scripture that comprise the Book of Mormon which, according to the Mormon faith, augments and completes biblical scripture. The BGEA website My Answer column was preceded by a question posed to Graham, "This couple keeps coming to our house and inviting us to come to their assembly hall to study the Bible. I'd like to know something about the Bible, but a friend of mine says this group is a cult. What exactly is a cult? They seem like nice people." The question mirrored narratives that launch numerous evangelical books attacking Mormonism which designate it as a "cult", including the 1998 book Mormonism Unmasked, by R. Philip Roberts, which opens with a chapter titled "Mormons on Your Doorstep". 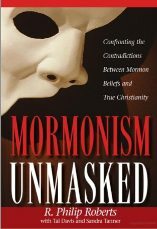 Mormonism Unmasked is published by the B&H Publishing Group, a division of LifeWay Resources, the main publishing wing of the Southern Baptist Convention, which officially designates Mormonism as a cult and claims 16 million members - slighter more than the estimated number of Mormons worldwide, about 14 million. "We heard from Christians who were once Mormons, Hindus, Jehovah's Witnesses, agnostics, witches, Buddhists, Unitarians, New Agers, Muslims, Satanists and non-Messianic Jews." "Use of such a term [cult] to describe Mormonism is highly offensive to members of the Church of Jesus Christ of Latter-day Saints. "Cult" carries the connotation of dangerous, even violent groups whose beliefs are irrational and whose practices are immoral and lawless (Koresh and the Branch Davidians, Heaven's Gate, Aum Shinrikyo, and The People's Temple are all prominent examples) . The term cannot be applied to Mormons unless it is so broadly defined that its use could be applied to virtually any religious body. Like racist language, the use of the word "cult" to describe a religion usually tells us very little about the religion, but a great deal about the person using the word." "The Grahams' actions could further cement conservative Christian support for Romney in the Nov. 6 election, even though most evangelicals don't consider him a Christian. That religious divide cost Romney heavily in the South Carolina primary, when he finished a distant second to New Gingrich, a Catholic but twice divorced." "According to the liberal website Daily Kos, the belief that Mormons are members of a cult is built into the BGEA's website. The site is programmed to call up articles about cults, including one authored by Billy Graham, when readers search for "Mormon." "Billy Graham's own website is automated so that Christians who search for the term `Mormon' will get this page result and be informed, straight from Billy Graham himself, that the Mormon Church is in reality a cult," said Daily Kos writer Bruce Wilson." The spreading story is hardly limited to liberal audiences - the conservative evangelical Christian Post was one of the early venues to pick it up, as Article Calling Mormonism a 'Cult' Removed From Billy Graham Website; Mormon convert Glenn Beck's The Blaze ran a version titled Article Calling Mormon Faith a `Cult' Was Scrubbed From Billy Graham's Web Site Following His Meeting With Romney. "Disgusting, whether you believe Mormonism is a cult or not. This is unfortunately a familiar theme. Evangelical "leaders" being co-opted by a poliltian and toning down the truth in order to curry political favor. They are either naive or responding to the siren call of political power.....or maybe both." "To all mormons, and all those that claim that mormonism is a part of Christianity. I warn you in all love that you have been deceived and I ask you to abandon your cults. I have shown clearly that mormonism is not Christianity and is not of the bible and my warning is clear also. You mentioned several places that Glen Beck's Website was railing against Mormons? I had thought that Beck was himself part of a somewhat cultish offshoot of Mormonism? Apparently, there are some people who frequent his website who are hostile to Mormonism as well. I'm not too surprised. It's just footage of Romney accepting the 2012 GOP nomination that was posted by what appears to be a Mormon Facebook group which appears to consider Romney God's pick. I would hardly be surprised if some leaders in the Mormon Church thought so too, but the Church has been wise enough to publicly stay out of that. There are so many offer to get Online loan but i trust only this, thanks to this online payday loan alternative information post where people easily comes to know the process for apply money. Thank you so much to this free of cost tutorial.